I mentioned last week that I have reopened an Instagram account (prompted by an insistent 9-year-old who wanted her own private account). Since I'm starting with a clean slate (and I admit that my skills with a camera phone camera are woefully lacking), I've been using this opportunity to really try to up my game. 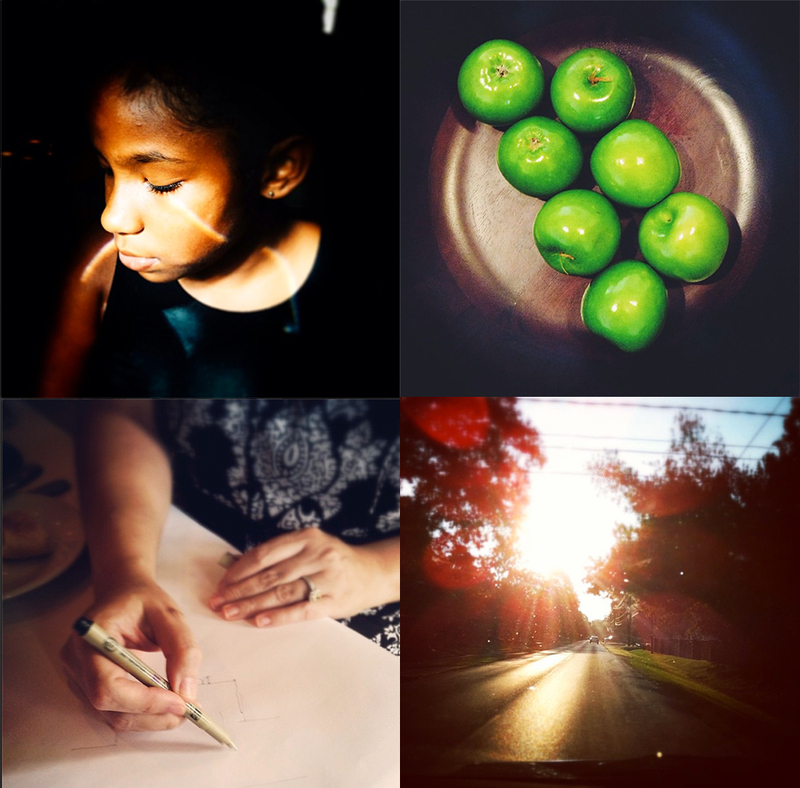 As part of this exercise, I've been researching Instagrammers whose work blows my mind -- people like Hailey. And Andrew. And Ayanah. And sweet mother of Gumby, Henri, who I'm told is only eleven years old. Can you imagine? ELEVEN! Anyway, I've been trying to shoot at least one image every day, really trying to learn the camera on my iPad (which I assume is of better quality than my old iPhone). As I mentioned in my TEDxHouston talk, I'm doing what any good photographer does and paying close attention to the light, and how the camera responds to it: how it flares in direct sun, or how different types of light imbue the photograph with different colours, from white to yellow to blue. Some of my recent shots are shown above. As I look at them, I'm realizing that having my iPad camera on me all the time, even during times when I don't have my large Nikon camera, is forcing me to slow down and really pay attention to the beauty around me. In so doing, I'm also remembering the benefit of cameras attached to mobile technology: as a practice, we all generally and innately tend to capture happy moments, or things that make us laugh, with our camera phones. I mean, think about it: 99% of the time, we use our phones as a convenient way to remember something lovely: being out with friends, or capturing something cute our kids or pets are doing, or even signs that make us laugh. We use our camera phones to take photographs of good things without even thinking. What would happen when we put a little positive intent behind it? A little gratitude behind it? So I've decided that not only am I going to use my mobile technology to get better at this type of photography, but I'm also going to try to refocus my energy to ensure that there's a shot of gratitude in at least one shot per day, as well. And I was hoping you'd like to join me. I'll be tagging my photographs #lookforthelight, and if you have an Instagram account (or are planning on getting one) and would like to play along, simply tag your photographs of the light in your life with #lookforthelight as well (either by putting that hashtag in the caption of your photograph, or adding "#lookforthelight" as a comment on your own shot). And by "light," I'm talking figurative or literal: your photographs can either be of actual beautiful lights -- like a sunset, or twinkle lights, or birthday cake lights, for example -- or it can be of people or things that you love, who bring you light. As long as you tag your shots with #lookforthelight I'll be able to see them all here, and every so often I'll pick a few favourites and feature them here on Chookooloonks, linking to your Instagram feed. I hope so. I can't wait to see the light you share. And with that, have a wonderful, light-filled week, everyone. Song: Ray of light by Madonna. I remember the first time I saw this music video, I was on a business trip in South America, back in 1998. I had just checked into the hotel and turned on the television, and this was on. I stopped unpacking and sat down on the bed, absolutely mesmerized by its light. I still am, really.